Imagine a power rack that is designed to take as little space as possible, while offering the ultimate in sturdiness. The Northern Lights Folding Power Rack combines both of these concepts to make a design that folds away when not in use and offers a sturdy and rigid frame. Using the 2"x3" Crossbox posts, the Folding Power Rack can be customized to a variety of heights to match your needs. Using Crossbox posts and the associated hole spacing means you can attach almost all of the Crossbox pieces allowing for endless possibilities of exercises. The unit measure 22" x 90" x 47". 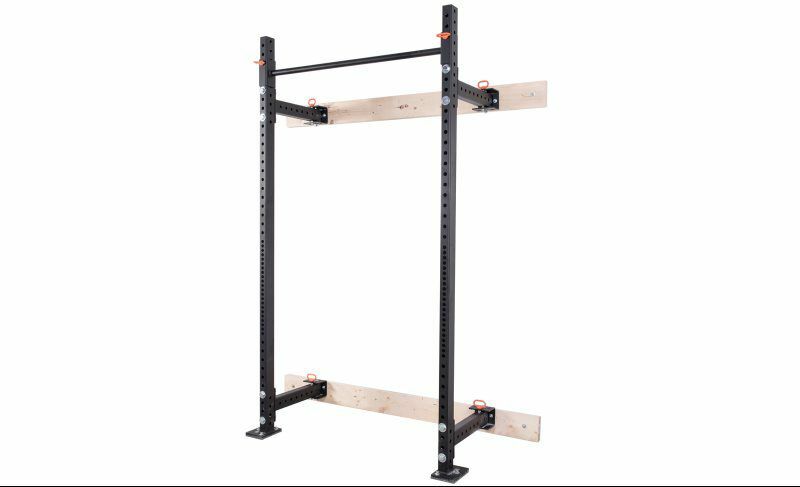 When put away, the Folding Power Rack takes up less than 5” of space from the wall, meaning you can have a top tier power rack in your garage or home gym without sacrificing space. Simple fold away the unit to the wall and enjoy the extra floor space for other activities. The Folding Power Rack kit offers the ultimate in customizability. Because the kit attaches to any of the crossbox upright posts, users can get the height they want by having the ability to choose the upright post* height that best suits them. This makes the kit perfect for spaces of varying height and different user preference. CrossBox rigs are designed from the ground up using the Northern Lights upright posts. Measuring 2" x 3" x 90" with a 7" x 5" foot panel, this post is perfect for garage gyms, studios and even commercial applications. The Northern Lights CrossBox rigs are completely modular and can be designed to fit your needs. Get started on designing your personalized rig today. The Northern Lights CrossBox J-hooks are a solid choice for use with any Northern Lights CrossBox rig. The j-hooks make changing exercises or adding weights quicker and easier. They are heavy duty and fit securely in place so you can focus on your workout without having to worry about hook slippage or movement. PLEASE NOTE: Bars, plates and accessories sold separately.. Important: The Northern Lights CrossBox Folding Power Rack Kit should only be mounted into solid wood studs or concrete. Metal studs or drywall are NOT recommended for this set-up. 2" x 3" x 90"